There’s a period in the year when I enjoy every moment and every shade: my days at the Ancora Hotel. It is not only a moment of relax for my family and I, it is also the moment that makes my passion true! such as two of Cattolica’s and Romagna’s most important competitions. My wife and my children are cuddled by the Magnani Family and can enjoy the beach and the town that they love so much. Instead I live a week of excitement because in this period, from May 13 to 22 approximately, I can attend two important competitions (The Gran Fondo degli Squali in Cattolica and the Noce Colli in Cesenatico). And what about the training itineraries? Breath-taking panoramas, fortresses and surprising views take you into the magic Romagna’s hinterland. At the Ancora Hotel you can enjoy the competition because also Filippo Magnani, the owner, is a cyclist. He handles all the bureaucracy tasks and manages to buy the bibs number! You don’t have to do anything! It is with him that every morning we decide the itinerary we will cycle. Often he comes with us; who better than a cyclist knows our needs? I love to be part of a group that enjoy this sport as I do. That’s why I’m proud to wear the Hotel professional cycle outfit: we’re brought together by the same passion! But the best thing is that if you want you can bring your bicycle in the room (even if my wife doesn’t agree). But don’t worry: it’s also safe in the video surveyed and locked cycle room. 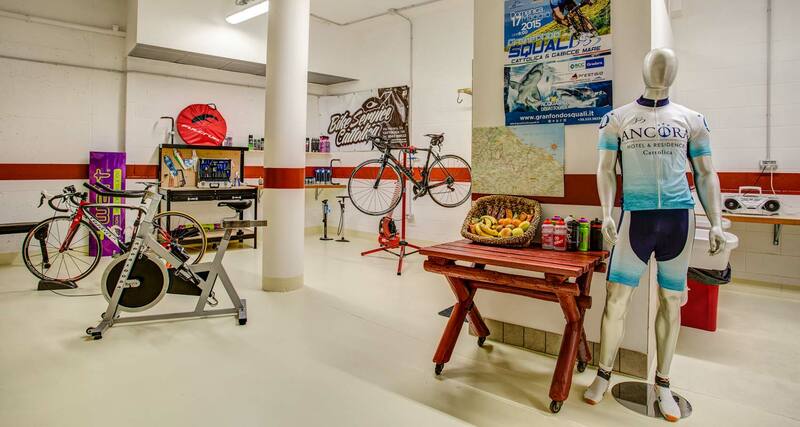 In the cycle room there are the grapples to hang it up, you can wash it and repair it, there’s a changing room and a small gym where to get fit. And if it rains there are rollers for a cycle indoor training! It means that you won’t loose lose a day! And the best thing is being together! I became attached to Agostino, "The Captain”, former cyclist that two years ago won the Nove Colli in his category “Over 60s”. Well, if your passion is your happiness here at the Ancora Hotel you are in the right place.